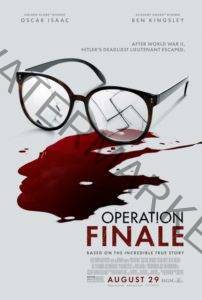 Operation Finale which stars Academy Award winner Ben Kingsley (Gandhi, Schindler’s List) and Golden Globe winner Oscar Isaac (Star Wars: The Last Jedi, Ex Machina), details the daring and brilliantly executed mission to capture Adolf Eichmann, one of the chief architects of the Holocaust. Fifteen years after the end of World War II, Israel’s intelligence agency Mossad and security agency Shin Bet – led by the tireless and heroic agent Peter Malkin (Isaac) – launched a daring top-secret raid to capture the notorious Eichmann (Kingsley), who had been reported dead in the chaos following Nazi Germany’s collapse but was, in fact, living and working in a suburb of Buenos Aires, Argentina under an assumed identity along with his wife and two sons. Monitoring his daily routine, Malkin and his operatives plot and execute the abduction under the cover of darkness just a few feet from Eichmann’s home. Determined to sneak him out of Argentina to stand trial in Israel, Malkin and Eichmann engage in an intense and gripping game of cat-and-mouse. Operation Finale is directed by Chris Weitz (A Better Life, About a Boy) from a screenplay by Matthew Orton. Oscar Isaac produced together with Jason Spire, along with Brian Kavanaugh-Jones and Fred Berger under their Automatik company. Operation Finale is executive produced by Matt Charman. If you like what read about Operation Finale, please remember to share Netflix New Releases on Facebook, Twitter or wherever you guys want it’s all appreciated.